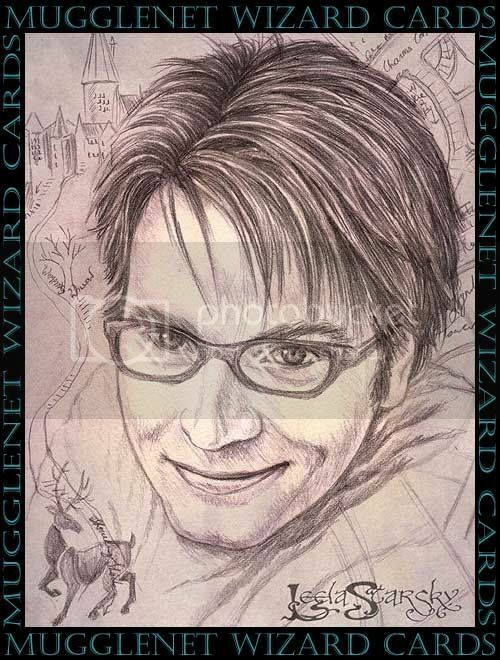 Well, here's a nice little surprise - we're allowed to post the Wizard Card art we were doing for Mugglenet Interactive! Well here he is at last! The Harry you've all seen in my icon and in various small or cropped incarnations. This was one of my very first CG illustrations! (and some would say that's obvious ;~P) The background I nicked from the Wizards painting I did, which you can see on the background of my journal. This one was all pencil with parchmenty colour added in PS. Hope you enjoyed seeing those. It's after 1am here, so I'll post more tomorrow. wow! You're so talented. It's mind-blowing. I have to lick his neck - I am powerless to resist! Yeah, these are exceptional. Harry has a bit of a Gyllenhaal (Jake, not Maggie) quality to him. These are darling! I love how serious Harry is and almost mean-mouthed in his determination, like he's thinking about something very, very hard. Whereas James is all snarky smiles and in your face and just....hot. I love the way your drew his chic old-school glasses and that smile! *fans self* Lovely. ok these are awesome - as is most everything I've seen of yours. James totally looks like Ewan McGregor! Maybe it's just the smirk, but man that's wierd (in a good way cause I love Ewan). Leela you are sooooo talented. 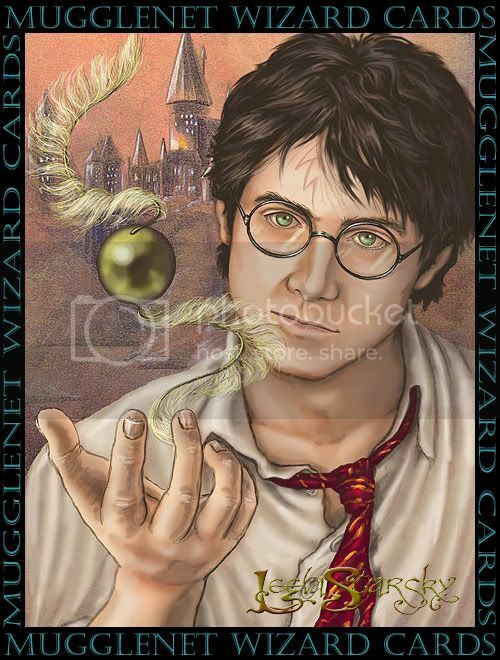 I really like the one of Harry and the snitch. Great job!! Thanks, moonsong. Glad you liked it! Those are so cool! Thanks for sharing them. AT LAST! I've been looking and looking for the Harry in your avitar! What I especially love about this picture of Harry is how you have captured so perfectly the boy about to become a man. He's SOOOO serious and the way his face is cocked just so...agh! It's as if he's thinking, "Let's go, Voldemort. Bring it on!" Just so amazing! James is another story all together. I love the smirk! It's so very James! And I love the subtle differences between him and Harry - just enough that you see Lily's influance in her son. However, and please don't take this personally, I just don't like his glasses. I'm sure it's a personal thing, but I just don't like them. Sorry! Love his face though! Spot on with his face! Heh. I deliberately went with Ray-Bans style glasses because of the era. Late 70s and all that. Click on the link for Mugglenet Interactive in my main post. The cards themselves are not up yet, several are still being drawn. But, it's my understanding, that they will be putting up a gallery of them soon. Those are beautiful. I love the one of Harry. I LOVE your James card, Leela. Much more personality than anything I've seen and... he looks like Ewan! I always pictured Remus as looking a bit like Ewan, but this is a perfect fit! Your Harry card is astounding. Great intense look. And his father does look like him without being an exact copy of him. Like the way my son and husband look alike. You can see the very striking resemblence, especially the eyes, but they look different enough so that he doesn't look like a clone of his father. Great job.